Red bean soup refers to various traditional Asian soups made with azuki beans. In China, red bean soup (紅豆汤, pinyin: hóng dòu tāng) is a popular dish. It is categorized as a tang shui糖水, (pinyin: táng shǔi) (literally translated as sugar water), or sweet soup. It is often served cold during the summer, and hot in the winter. Leftover red bean soup can also be frozen to make ice pops and is a popular dessert. 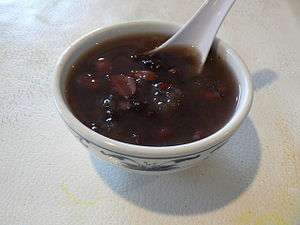 In Cantonese cuisine, a red bean soup made from rock sugar, sun-dried tangerine peels, and lotus seeds is commonly served as a dessert at the end of a restaurant or banquet meal. Common variations include the addition of ingredients such as sago (西米, pinyin: xī mi), tapioca, coconut milk, ice cream, glutinous rice balls, or purple rice. The two types of sugar used interchangeably are rock sugar and sliced sugar (片糖). Shiruko (汁粉), or oshiruko (お汁粉) with the honorific "o" (お), is a traditional Japanese dessert. It is a sweet porridge of azuki beans boiled and crushed, served in a bowl with mochi. There are different styles of shiruko, such as shiruko with chestnuts, or with glutinous rice flour dumplings instead of mochi. There are two types of shiruko based on different methods of cooking azuki beans. Azuki beans may be turned into paste, crushed without keeping their original shape, or a mix of paste and roughly crushed beans. There is a similar dish, zenzai (善哉、ぜんざい), which is made from condensed paste with heat and is less watery than shiruko, like making jam or marmalade. In Western Japan, Zenzai refers to a type of shiruko made from a mixture of paste and crushed beans. In Okinawa Prefecture, the term "zenzai" commonly refers to this bean soup served over shaved ice with "mochi". Other toppings, such as sweetened condensed milk, are occasionally added for flavor. It is loved by many Japanese, especially during the winter. The half-melted sticky mochi and the sweet, warm red bean porridge is thought by many to be an absolute delight. Shiruko is frequently served with a side dish of something sour or salty, such as umeboshi or shiokombu to refresh the palate as shiruko is so sweet that the taste may cloy after a while. In Tottori Prefecture and Shimane Prefecture, shiruko is also used for zōni, the special soup for New Year celebration. Its variant also contains noodles instead of saealsim. 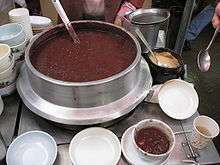 In Korean cuisine, red bean soup is called patjuk (팥죽), and is commonly eaten during the winter season. On Dongjinal, a Korean traditional holiday which falls on the winter solstice, Korean people eat Donji patjuk, which contains saealsim (새알심) meaning bird egg, a ball made from glutinous rice flour, named such due to its resemblance to small bird's eggs, possibly quail eggs. In old Korean tradition, patjuk is believed to have a mysterious power to drive evil spirits away. According to Korean traditional folk beliefs, the color "red" is a symbolic color of positive energy which can defeat negative energy. Cooking and eating patjuk is a ritual to prevent bad luck, epidemic disease, and comes from evil spirits. Before eating the dish, Korean people used to serve it their own house shrine, they scattered it all around the house like in the kitchen, storage house, gate, yard and so on. These customs have been handed down through Chinese mythological stories. According to Hyungchosesigi, there was a man named Gong Gong. He had a bad son, and after he died he became a god of epidemic disease. Because of his cruel temper, a lot of people were killed by epidemics. Trying to find a solution to prevent infectious diseases, they recalled the fact that the son of Gong Gong hated "red bean soup" when he was alive. Thus, people made red bean soup and scattered it all around the house. And then the epidemics disappeared. Since then, patjuk has been the food that all spirits hate. Eating patjuk is a ritual to wish for abundant harvests. Ancient Korea was an agrarian society, and a rich harvest has always been a pivotal issue for them. Koreans eat Patjuk (red bean soup) on Dongji(winter solstice). When they make Patjuk (red bean soup) they add small dumplings which were made of rice as the same number as their age. By fully relaxing and eating nourishing health food, they wanted to have a preparation period before starting farming in the spring. Patjuk embodies a custom of conserving food. Koreans usually eat rice and side dishes. However, in the wintertime when Korean families had shortage of grains, patjuk became a complete meal itself. It could be made of simple ingredients. For example, red beans, water, small grains of rice and also it requires no need for extra side dishes. Thus, when people prepare some events in winter, patjuk is an economical food for conserving grain. Vietnamese cuisine also has a similar dish, called chè đậu đỏ. It contains added coconut milk and sugar. It is served cold. ↑ "Red Bean and Black Glutinous Rice Dessert". en.christinesrecipes.com. Retrieved 4 August 2014. 1 2 "shiruko Japanese". Uwajimaya. Archived from the original on 2007-11-21. Retrieved 2007-11-13. 1 2 3 4 Otani, Hiromi (2004-03-05). "Shiruko: Sweet Bean Soup to Warm You Up in Cold Weather". Nipponia on Web Japan. Retrieved 2007-11-13. Kim jong-dae. 12 months seasonal customs. Seoul: Sanha, 1996. Jang joo-geun. Seasonal customs in Korea. Seoul: Hyunseul, 1984. Jeong sung-mo. Seasonal customs in Korea. Seoul: Hakgojae, 2001. Korean national fork museum. Chosun seasonal custom. Seoul: Minsokwon, 2003. Hong seok-mo. Seasonal customs. Seoul: Bogosa, 2003. Kang moo-hak. Seasonal customs in Korea. Seoul: Zipmoondang, 1987. Wikimedia Commons has media related to Zenzai.